Today is Greenery Day in Japan. I have no idea how we are supposed to celebrate this. It's not a traditional holiday, it used to just be known as the bridging holiday between Constitution Memorial Day (thank you USA for writing the constitution and giving us a holiday in the nicest weather of the year). So I have decided on my own that a review of a book including the word Green is the way I am celebrating (also by going on a road trip to Ikea which is a few hours away, this is a scheduled post). 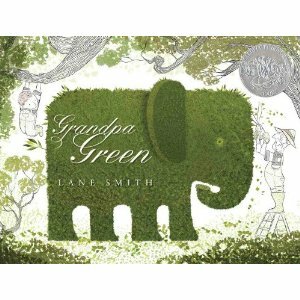 This is somewhat about nature, or at least the control of it, as Grandpa Green uses topiary memoirs to pass on his experiences to his grandson. A path through the garden shows us Grandpa's life from his time as a squalling baby to his army days and his marriage. But it also gives us and his grandson into a present that is plagued with forgetfulness. I was in Japan by the time my grandmother fell victim to dementia. She had such clear visions of some episodes of her life, however, and those were the ones she focused on. It's funny, but even though I only visited her a few times then, I learned much more about her past when she had dementia than when she didn't. When she was more mentally spry we talked more about books and movies and music and travel and the future, I didn't know much about her past until she had trouble remembering her present. This lovely book brought back a lot of memories of my beloved grandmother and for that only it gets two thumbs up from me. My kids enjoyed it just as much, however. Smith is an award-winning artist (two Caldecott honors!) and this book shows the reason why. The verdant lushness of the tree memories is striking against the pencil sketches of the boy and his grandfather, showing young readers the nature of dementia in a much better way than a bunch of words could. This is a wonderful book to read aloud between generations. This got me thinking about what I would include in my memory garden. What would you include in yours?